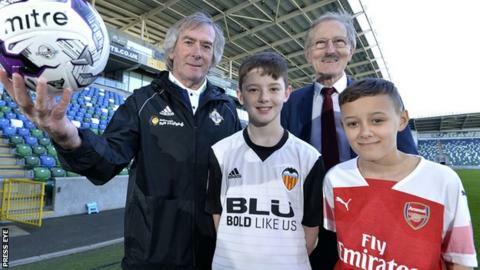 Super Cup NI has mades two big signings with Arsenal and Valencia confirmed for their debuts in the youth tournament this summer. Premier League giants Arsenal will cross the Irish Sea with their U15 team to challenge in the Junior section. Spanish club Valencia will fly their talented Under-17 squad to contest the Premier section. "We are excited to welcome clubs of the calibre of Arsenal and Valencia," said Super Cup NI chairman Victor Leonard. He added: "When you consider the talented players who came through both clubs' academies there is no doubting the high quality we can expect to see in a few weeks time." David Silva, Isco and Jordi Alba are all graduates of Valencia CF's youth system while players such as Jack Wilshere and Alex Iwobi progressed through the ranks at Arsenal. "Super Cup NI has a rich tradition of bringing together the best clubs and youth players from across the world and I am proud to add Arsenal FC to the list of iconic clubs to attend this globally recognized event," said Arsenal Academy manager Per Mertesacker.